“Come watch Veep with me,” Mr. Bookworm said this evening. “It’s got really clever writing and a great cast, and it’s often very funny.” He’s absolutely right and normally that would be an enticement to watch a TV show. The problem for me is that each of the characters is loathsome — stupid, vindictive, petty, arrogant, hate-filled, venomous. Moreover, they exhibit these traits against each other, their colleagues and friends. Veep isn’t the only show that has such horrible people. In fact, being horrible lately seems to be a prerequisite for hit shows: A psychopathic chemistry teacher who becomes a drug kingpin (Breaking Bad); a mafia kingpin who kills lots of people (The Sopranos); a devious, dishonest ad men and the equally devious, dishonest, desperate, addicted, and adulterous people who inhabit his world (Mad Men); and a sociopathic bootlegger and his psychopathic cohorts (Boardwalk Empire) are just a few of the horrible people who spring to mind in the top-rated shows for adults. And Lord knows, we all know about kid shows, with smart aleck, sarcastic, disrespectful, know-it-all kids smugly triumphing over stupid, venal adults. It ain’t the Brady Bunch any more. I don’t know whether popular TV shows represent a mirror we hold up to ourselves or if they are a projection of what we’d like to be. All I know is that, in the old days, most of the stars of TV shows, barring a few overwrought soap operas, were people one could like. Lucille Ricardo might have been immature and self-centered, but she was also enthusiastic and she always led with her heart. So many of those shows ended with a kiss or a hug between the main characters. Leave It To Beaver, The Brady Bunch, Three’s Company, All In The Family, M*A*S*H — no matter how vapid they may be now or how politically correct, they involved characters who were striving to be good or who were, at the very least, silly. None were bad. 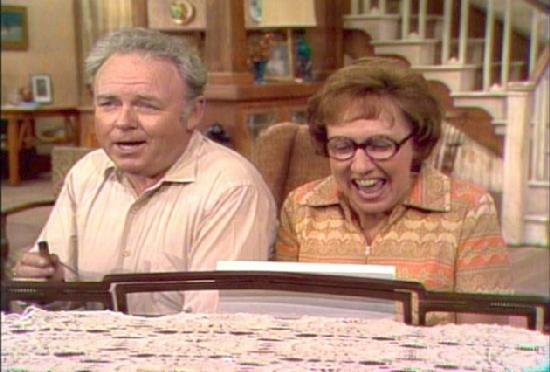 Even Archie Bunker, with all his awful “right-wing American” prejudices had a solid core that endeared him to audiences. When push came to shove, and no matter how reluctantly, Archie did the right thing (at least according to Norman Lear’s rubric of what was right). Anyway, it’s just a thought. Perhaps I’m putting too golden a glow on the shows I grew up watching. I just know that I really hate spending time in the company of today’s TV characters. I have this terrible sense of revulsion when I’m around them too long.